Superb quality sheep shears, used across Europe for more than 30 years and now available in the UK. 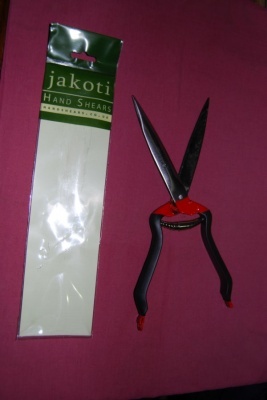 Jakoti hand shears are ideal for all aspects of shearing, hand trimming and dagging. More efficient than the usual double bow design, the blades cut cleanly with the minimum of effort. The carbon steel blades are amazingly sharp and easily re-sharpened when needed. The ergonomically designed handles are comfortable for long periods of use and the low tension spring makes them easy to operate. Hand crafted from high quality carbon steel, the self sharpening design of the blades ensures a clean cut every time. Made using traditional metalwork skills and exclusively imported, these shears have been refined and developed over the last 30 years and are unmatched for design quality and performance.